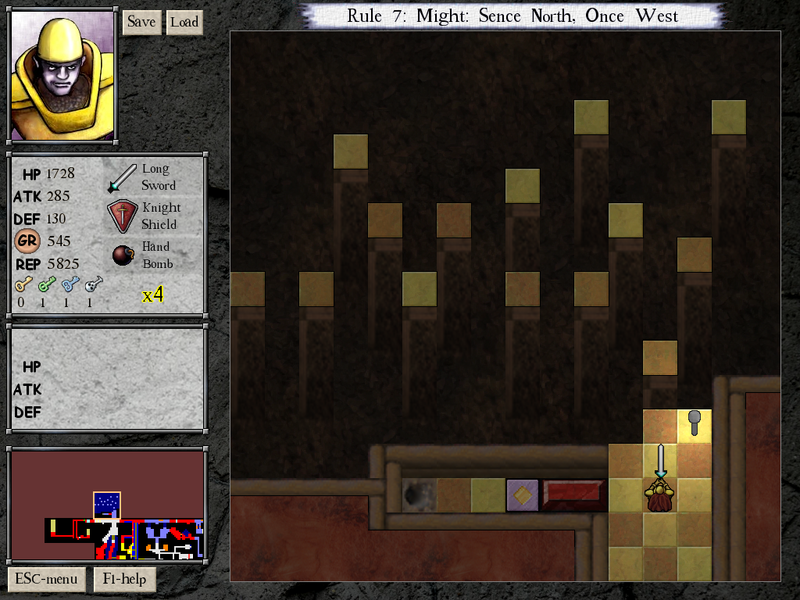 I know I just compared DROD RPG to Time Zone, but by the end, it was reminding me more of my experiences with Rhem. 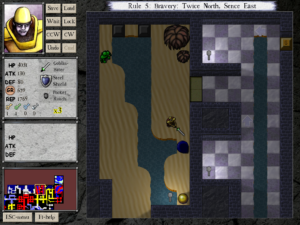 As I cleared paths of their obstacles, unlocking gates and killing monsters who stand in the way, the area I was playing in effectively expanded, until I was playing with the whole dungeon rather than just my immediate vicinity. As in Rhem, I spent so much time running madly from place to place to do stuff I wasn’t prepared for the first time through that I pretty much internalized the map, which led to beating the rest of the game in a manic burst rather than take a break and lose my place. When I talk about backtracking, I’m not just talking about going back for special items, although that was part of it, but also for stuff as simple as the monsters who were too tough for me initially, but who could now be easily killed for their money, which I could use to upgrade my stats, enabling me to mug even tougher monsters. At any rate, it’s a real contrast to regular DROD, where you generally leave solved areas behind and don’t look back. Mind you, when I say that I beat the game, I’m only talking about getting to the end credits. There’s an extra boss in a secret area just off the final exit, and I suppose I won’t be fully satisfied until I do him in. Without him, the final boss is a Slayer, which would be more satisfying if I hadn’t already killed one in the secret level of chapter 1. (In particular, when you first see him, his projected damage is ridiculously astronomical, due to the combat mechanic’s nonlinear response to power differences. It’s a nice “You gotta be kidding me” moment, but you only get one of those per enemy.) But that’s what you get when you play the game out of intended order. 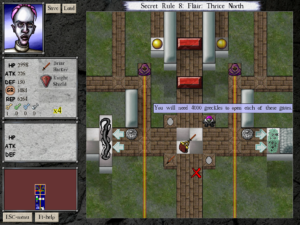 The designers were clearly thinking in terms of players completing the game the easy way first and only afterward going back for the secrets. That’s why the new items in the secret level were unexplained; when you encounter them over the normal course of chapter 2, there’s usually a helpful guy 1That’s his name within the game engine. Helpful Guy. It says so when you click on him. nearby to describe them. I have a pretty clear idea of what I have to do to beat this extra boss, although in order to pull it off, I’ll have to defer getting the Really Big Sword until much later in the game. That’ll make things difficult. Getting the Really Big Sword was a turning point for me, where I suddenly started being able to easily get health significantly faster than I spent it. I suppose I should have taken that as a warning. If it seems easy, you’re doing it wrong. Paradoxical though that is, it could be this game’s motto. 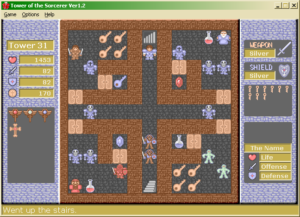 A day or two before my final push, I saw a mention on the DROD forum of Tower of the Sorcerer, a freeware game by “Oz and Kenichi” that allegedly used the same combat system as DROD RPG. Well, the similarities don’t end there. 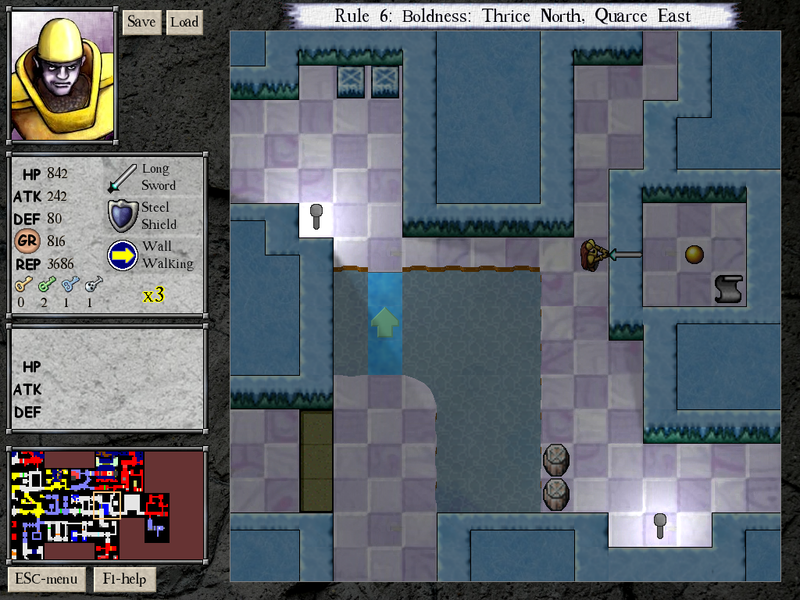 Both games are based on managing health and three different colors of keys (one of which is reserved for plot-crucial doors). I think the most striking point of resemblance is the devices for using money to raise your stats, which function nearly identically in both games, offering you a choice of health, attack power or defense power (with attack increases substantially less than defense increases), increasing the price with each use, increasing the gains as you get to remoter instances of the device (thus motivating you to hold off on upgrades until you can reach a more powerful one). Is DROD RPG a rip-off, then? Hardly. It’s based on TotS, and acknowledges this debt in the credits, but it also adds quite a bit of complexity. From what I’ve seen, TotS doesn’t seem to have anything like the percent-based damage from hot tiles and aumtlichs, and it definitely doesn’t have any way of doing stuff like trying to work your way around a goblin in a tight passage without turning your back to it (one of my favorite puzzle-like bits in DROD RPG). And anyway, I think the folks at Caravel Games earned our indulgence on this point through their indulgence of Wonderquest, which is about as direct a DROD imitation as you could hope to find (although it’s also embellished), and has a section of the official DROD forum devoted to it. Finally, let’s talk plot a little. Chapter 1 is about Tendry’s escape from the Beneath, chapter 2 supposedly about his rescue of his countrymen who had been abducted by the Empire. We don’t actually get to see him do the latter, though, unless there’s something past the secret boss. There’s a distinct non-ending and promise of sequels, and, well, we’ll see how that turns out. On the other hand, the Empire is discussed enough that I think I’m finally starting to grasp the DROD overplot. As I understand it, the Empire has two major factions, the Archivists and the Patrons, who split on how they approach the pursuit of knowledge. The Archivists are trying to get all the facts, whereas the Patrons are trying to get as many facts as possible. These might sound like similar goals, but they disagree when it comes to things that generate new facts — for example, foreigners. The Patrons like such things, because they’re an endless source of new things to learn, while the Archivists dislike them, because they perpetually render the Archivists’ knowledge incomplete. Thus, the Archivists want to destroy foreigners while the Patrons want to protect them. (Yes, only bad guys are completists.) It’s the Patrons who move the entire population of Tueno underground, which Tendry sees at first only as an enemy action, not realizing that they’re doing it to save them all from the Archivists’ army. The thing that hasn’t been resolved is what the Patrons intend to do with all these people. Fight a decisive battle against the Archivists and return them to their homes? Release them elsewhere, where the Archivists won’t find them immediately? Keep them in cages and study them? Tendry comments at one point about the Patrons “collecting” his people, which makes me think this isn’t supposed to be a temporary condition. The Archivists are evil, but you have to bear in mind that the Patrons are products of the same deranged system. Who knows what they’re capable of? Not me, certainly. The ending of that story has not yet been written. 1. ↑ That’s his name within the game engine. Helpful Guy. It says so when you click on him. And so, having done this, I have by now made it all the way to the exit of the secret level. And this presents a fresh problem. I mentioned before how the previous levels had some places that could be reached with special tools, including ones (such as the grappling hook) that I’ve only acquired in the secret level. The problem is that once you’re into the main part of the secret level, you can’t go back. There’s a one-way force arrow preventing you from backtracking. I had been hoping that the exit on the far side would return me to a previously-inaccessible part of the previous level, but no, it just sends you on to chapter 2. You can bring one of the special tools into the beginning of chapter 2 with you, but it doesn’t seem to do any good. In a way, the secret level reminds me of the endgame of Time Zone. They both have a point of no return, producing gameplay marked by repeatedly restoring much earlier saves in order to get back to said point of no return with more stuff, or at least different stuff. The crazy thing is that I know for a fact that people involved in the production of DROD RPG have read my blog post complaining about that very ending, and how it extended the experience of the game by diluting its fun. But of course it’s very different here. It isn’t just a matter of entering the same series of commands, hoping not to make a mistake. Every time I play through the familiar bits, I’m asking myself if I can squeeze it a little more, come out a few more hit points or greckles 2The unit of currency in DROD. ahead. 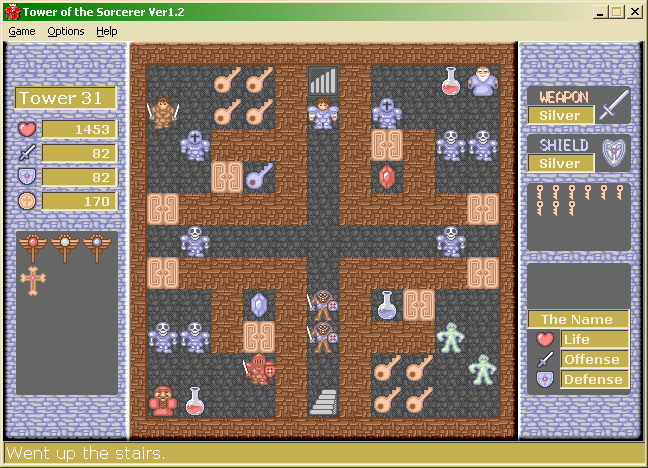 Plus, of course, everything about the secret level and the inaccessible areas is completely optional. 2. ↑ The unit of currency in DROD. So, I managed to get through the alternate exit in chapter 1, the one behind the wubba. I don’t want to give away too much, but it involved exploiting a special property of one of the useable items, a property that I had read about when I found said item, but which I had forgotten about, because it didn’t seem important at the time. When I read about it again during my second playthrough, knowing what lay ahead, it suddenly clicked. I had access to another wubba-slaying tool all along and didn’t know it. But using it in that way meant that I couldn’t use it elsewhere, and consequently getting through the necessary areas involved massive loss of health. But that’s okay, because I had massive amounts of health to lose. This game doesn’t use a D&D-style hit points system, capping the benefit you get from healing potions at your “max hit points” attribute determined by your experience level and other stats. Instead, it’s more like the healing system in Ultima 1, where the only limit on your hit points is imposed by how much healing you have available. Past the alternate exit is an entire secret bonus level. Many tools are scattered around this level, of various degrees of familiarity, including the long-anticipated tool for jumping over 1-square gaps. (It turns out to be a grappling hook.) I hope I manage to get back into the previous level to take advantage of it — by the time you get it, you’re past a bunch of one-way arrows and have no direct route back. 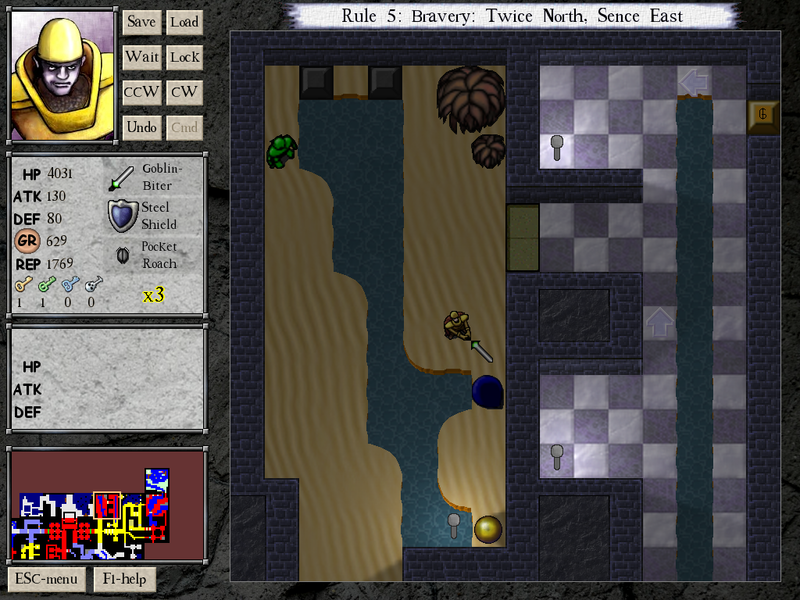 The game also makes you ditch your weapon and use far weaker ones for their special properties. I had seen a Wooden Blade already in the course of chapter 2: its whole purpose is that it can be used in places where metal weapons are forbidden. I hadn’t seen the “briar hacker” before, but it was pretty clear from its name what it’s good for: cutting through briars. But what about the “lucky blade” that I found deeper in the corridors? I have no idea what its special attributes are, but I assume they’ll be crucial to getting through the level, so I suppose I should keep playing chapter 2 at least up to the point where it’s explained. By now, I’m well into the second and more difficult of DROD RPG‘s two chapters. Apart from plot, the two chapters are self-contained: at the beginning of chapter 2, Tendry is stripped of all his equipment. Chapter 2 makes things more complicated by providing options that were absent in chapter 1, such as spending money to raise your stats. Finding adequately efficient ways to spend your scarce resources is tricky. I pretty much played chapter 1 straight through, but in chapter 2 I’m frequently saving the game to try out different options and see how they play out. I’ll probably want to restart completely at some point, to better take advantage of some secret areas I didn’t notice early enough to use optimally. But that might wait until I’ve completed chapter 1 to my satisfaction. There seems to be a whole chain of undocumented special items that enhance Tendry’s ability to go places and do things and get more special items, and I’ve probably only scratched the surface of it. The first significant item is an invisibility potion which lets you sneak by spontaneously-attacking monsters. This seems somewhat optional: it doesn’t actually open up any new territory, but it does make it a lot easier to get another special item, a one-use “wall-walking” token — that is, a device that teleports you forward two squares, regardless of obstacles. This can obviously be applied in all sorts of situations, but is best used in a situation where nothing else will do. My first thought was to use it to get into a certain doorless enclosure I had noticed containing a door-opening device called a Portable Orb, but once I was in that enclosure, there was no way out. So instead I used it to enter a different inaccessible area that had a door that could be opened from the other side. There, I found a handheld bomb, a device capable of destroying even wubbas. And that’s as far as I’ve got. 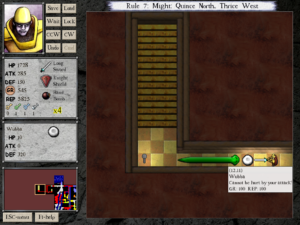 I can kill the wubba blocking the staircase near the final exit, but the bomb doesn’t have enough range to kill the snake blocking the corridor behind the wubba as well. It’s likely that there’s something else I should be using the bomb on, but it only affects items, not architecture. There are a couple of other obvious inaccessible spots, including some some platforms leading out over a pit like stepping stones, but with no way to get from one platform to the next. There’s a similar set of platforms in chapter 2, with a Really Big Sword (the kind Beethro uses) clearly visible in the middle. There has to be some way to jump from platform to platform — say, a pogo stick or something. I haven’t found any devices like these in chapter 2 yet. They seem like general-use items, so it’s possible that they’re introduced over the normal course of the game. I’ve only just encountered the first non-portable bombs, for example, so it’s conceivable that the game will introduce handheld ones next. If so, encountering new items in chapter 2 may give me some idea of which obstacles they should be applied to in chapter 1. Let’s take a moment to examine how the monsters of DROD were adapted for DROD RPG. 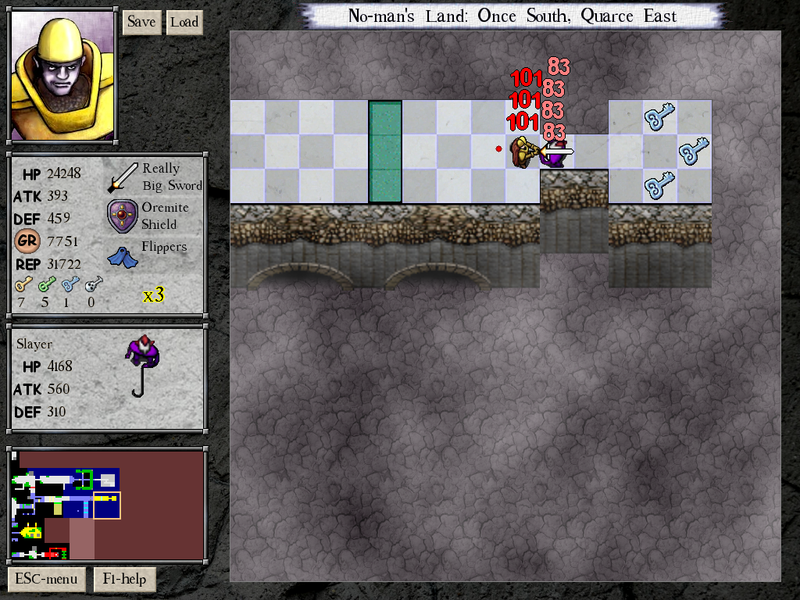 The main thing that distinguishes the monsters from each other in the original game is how they move: roaches and tar babies charge straight at you, roach queens flee, evil eyes stay still until you cross their line of sight, goblins try to avoid your sword and attack you from behind, rock golems tend to get stuck on obstacles that other monsters are smart enough to go around, and so forth. Well, in DROD RPG, monsters don’t move. They just stand there blocking passageways until you decide to fight them. So, that’s a whole lot of distinguishing characteristics scrapped. As a result, most of the monsters are pretty much the same thing with different stats. Mind you, that’s something that a game of this sort really needs. Like most RPGs, it’s all about the steady escalation of power. The game weirdly abstracts away some of the escalation effect by simply giving each level a multiplier that affects all potions and power-ups on that level, but I suppose applying it to monsters stats as well would be more honesty than the genre could bear. At any rate, the developers seem to have needed more gradations of monster stat than easily fit onto the set of original DROD monsters, and have crammed in some extras, repurposing some of Beethro’s puzzle-solving tools such as the fegundo and the decoy as monsters, as well as making up more powerful versions of existing monsters. It all reminds me a little of Star Wars-based games such as Dark Forces that have you fight things like the the Interrogation Droid and the Imperial Probot that appeared in the films in brief non-combatant roles. There is still some variation of behavior, though. Some monsters, such as the evil eye, take a swing at you automatically when you pass right in front of them. People with swords get an extra attack in at the beginning of combat if you have to go through the sword to get at them, as is sometimes the case. Of all the creatures I’ve seen, the one that comes closest to its original form is the Aumtlich, which still has its deadly screen-crossing eyebeams. They don’t have the same effect at they did on Beethro — instead of freezing you in place, walking through the beam drains half your hit points, which is yet another example of stats substituting for movement. 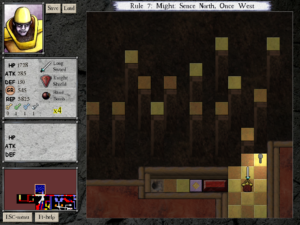 But at least it’s using the room geometry, and there are some puzzles made from it. The creatures called “brains” are another notable special case. As in the original, they’re not powerful combatants themselves, but they make all the other monsters in the room more formidable. Again, stats take the place of movement: where the DROD brains gave the monsters access to a pathing algorithm, the DROD RPG ones double their attack strength. Then there’s wubbas. Wubbas are essentially giant fluffly marshmallows, impossible to destroy with a sword. They’re harmless, but only in the sense that they can’t damage you. In Journey to Rooted Hold, where they first showed up, they often thronged around Beethro until he couldn’t move and had to start the room over. 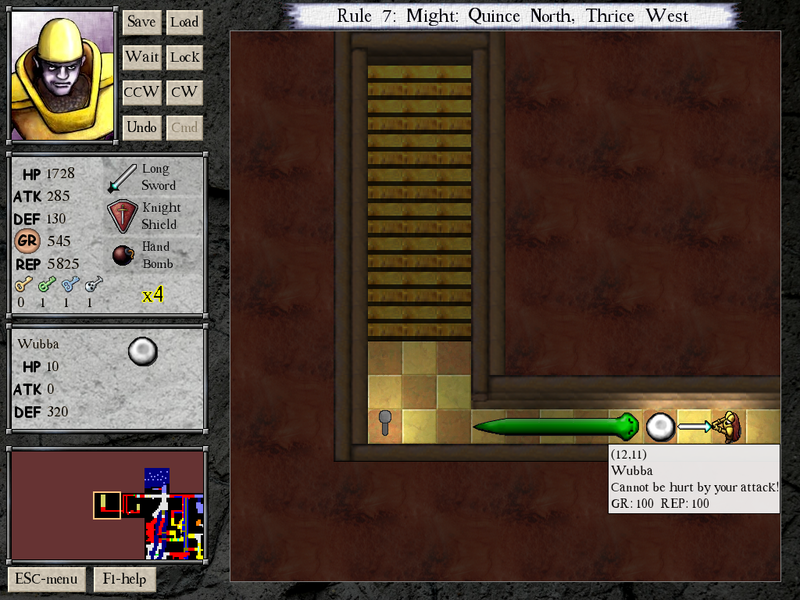 I’ve only seen one wubba so far in DROD RPG, where it was standing guard over a semi-secret hallway. The interesting thing is that its invulnerability wasn’t a special property: instead, it simply had a very high defense stat. In theory, you could kill it with a sword if you found enough power-ups, although I don’t think enough exist in Chapter 1. Still, there just might be a way past it by using special items. In fact, I’d have enough attack power to get by it if I only had the Slayer’s hook that I can see tantalizingly discarded in an inaccessible part of one room. I’ll talk about that more in my next post. Last September, a game came out that I didn’t have time for at the time, but greatly wanted to try: DROD RPG: Tendry’s Tale, a work in the DROD setting, with familiar creatures and a plot linked to DROD: The City Beneath. The change in game mechanics is reflected by a change in protagonist: instead of Beethro, we have Tendry, a Stalwart of Tueno. In TCB, the Stalwarts charged en masse to their slaughter at the hands of the Empire, leaving only a few scattered survivors to assist Beethro with occasional puzzles. Tendry is one of those survivors. It’s always interesting to see how a game franchise weathers the translation from one genre to another, especially if the genres are greatly different. And the source material here is far from RPG-like: DROD is a puzzle game, entirely deterministic, with a combat model in which everything, including the player, has one hit point and no defense: whoever manages to strike first immediately wins. 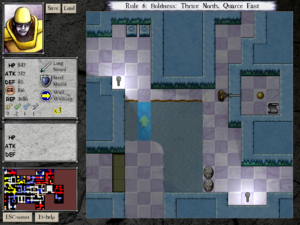 DROD RPG preserves a lot of the DROD feel simply by using the same graphics (scaled up a bit), but throws away most of the tactical puzzle-solving in favor of stat-based toe-to-toe monster-bashing. This doesn’t mean it plays like a typical RPG. The designers have chosen to keep the determinism of the original DROD and do without any random factors in combat. Instead, you just automatically take turns trading blows with the monsters, and each blow does damage equal to the attacker’s Attack rating reduced by the defender’s Defense rating, until one of you is dead. Just by examining a monster’s stats, you can tell in advance how many hit points you’ll lose by engaging it. In fact, the game spares you the trouble of doing the math yourself and just includes the battle outcome (given your current stats) in the monster’s right-click tooltip — a sterling example of the “conveniences are nice” principle. 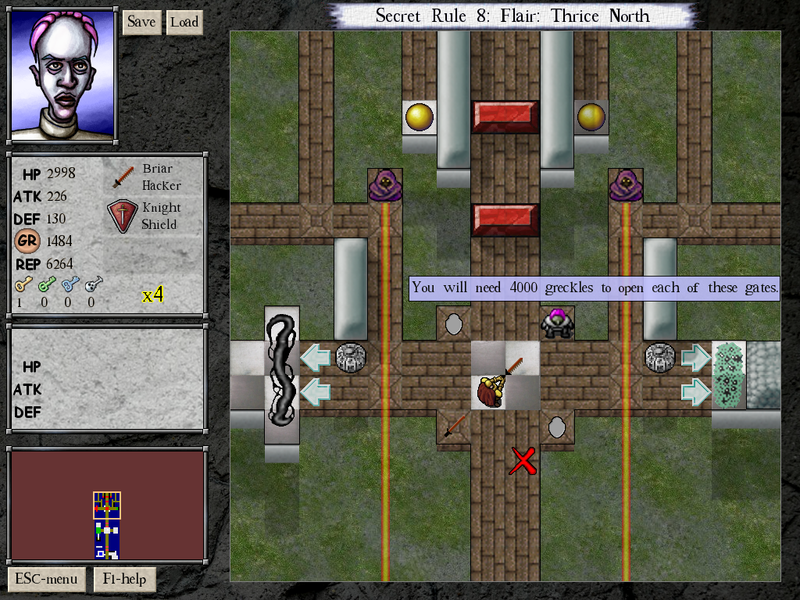 This extreme simplification at the tactical level means that the game is mainly played at the strategic level, where it becomes one huge resource-management puzzle. For example, sometimes you have two possible routes to a place you want to get to, one blocked by a monster, one blocked by a gate that can be unlocked with a key. (This is the lockpick-that-breaks-off-in-the-lock sort of key: they’re not specific to a single gate, but they’re consumed on use.) Either route involves some kind of expenditure of a resource, those resources being keys or hit points. You might be able to reduce or even eliminate the hit point cost, though, by finding powerups or equipment elsewhere, although you’re certainly going to pay some sort of price for such a gain. Basically, it pays to be circumspect and not rush into battles until you know what your options are. The irony is that this is exactly the opposite of how Tendry claims to act. The Stalwarts put great stock in the courage — the level titles in the game are derived from the “rules” that the Stalwarts live by, and all the rules seem to be synonyms (“bravery”, “valor”, etc.) The occasional narration we get from our hero is full of comments about how a Stalwart always leaps feet-first into danger and recks not the cost and so forth. This is, of course, how the Stalwarts got themselves killed. I haven’t gotten very far into the game yet, but I’ve seen enough flashbacks to know that Tendry is a reluctant Stalwart, a would-be writer who was pushed into the army by his father. It’s entirely possible that he survived the massacre by being cowardly by Stalwart standards and acting like he does under player control. Or maybe not. Beethro himself is a big ugly guy who uses a Really Big Sword to solve all his problems, and was made the hero of a thinking game. So perhaps Tendry is just intended as a similar mismatch between apparent character and gameplay. Well, I’ve reached the point where the game was crashing to the desktop before, a long cavern with Rocko’s nameless belle in a cage dangling from the ceiling, and it’s still crashing. Looks like this one is staying on the Stack. Am I the only one to experience this problem? Has anyone else ever actually tried to finish this game? I see no evidence of it on the Web. Pretty much all other mentions of the game are just download links of various sorts and reviews that can be summarized as “Mediocre, avoid”. So, let’s try to analyze that a little more. Why is it mediocre? Compare it to other 3D platformers: in sophistication of gameplay mechanics, this game lies somewhere between the original Crash Bandicoot and the the original Sly Cooper, probably closer to the former than the latter. I pick those two games as examples because they’re also pretty successful as comedies, which is one area where Rocko really falls down. And this isn’t just about the lack of jokes: there really aren’t a lot of explicit jokes in Crash Bandicoot either. Partly it’s the character. Crash and Sly are both little guys deliberately taking on things that are plainly more powerful than themselves. That’s a premise with pathos: when the little guy wins, it’s a triumph for all mankind, and when he loses — and, let’s face it, you typically die a lot more often than you succeed in a game — it helps you to sympathize with his plight. More to the point, there’s always something a little ridiculous about a lone hero challenging an army, even when it’s played straight. Making the hero a little pathetic just makes the ridiculousness obvious. When I played Crash Bandicoot, I got the impression from Crash’s expressions and body language that he basically knew how outmatched he was, how often he was dying and how annoying it was — but, of course, that this wasn’t going to stop him from persevering. That’s a comic character. Rocko, on the other hand, is a bruiser. There’s no pathos in a bruiser triumphing over another bruiser. He sometimes fights things that are bigger than himself, but that’s just a way to show off how manly he is. When he fails, we’re not sympathetic, we’re just disappointed in him. Partly it’s the pacing. Actions in Rocko’s Quest are slowish — I’ve already noted that there’s enough of a delay on swinging weapons to necessitate the Underworld Shuffle — and if there’s one thing slapstick can’t survive, it’s being slow. It also strikes me that enemies simply have too many hit points for good slapstick. In the other games I’ve mentioned, anything other than a boss monster that you manage to attack successfully just falls down instantly. That’s the kind of reactivity slapstick wants: one action, one response. In Rocko’s Quest, until the last two levels, even the most powerful weapon available takes three hits to take down the smallest, weakest foe, and more typical monsters have to be hit over and over again. If the humor is in the game’s reaction to your actions, the orcish grunt and flinch, it’s a joke repeated far too frequently to stay funny. Rocko’s Quest basically lacks moments like that. For the most part, the only surprises are of the form “Whoops, there’s a pit you didn’t see,” which hardly relieves any tension. There’s only one moment in the game I can think of that really seems joke-like in a narrative way, and that’s a bit near the end involving a broken bridge across a chasm. An imposing castle lies just beyond the bridge, clearly your destination, but the gap is just a little too wide to jump across, and the player is likely to lose quite a few lives trying. To make progress, you have to stop trying to reach the castle and instead go off to the side and look down into the chasm, where you can see the first of a series of rising-and-falling platforms leading down to the chasm floor. So, there you have tension and resolution in the form of a problem and its solution. And it does feel like a joke, but it’s a joke at the player’s expense.